The Atlanta 40k Series is Atlanta's premier Warhammer 40,000 tournament series. The next event will take place on April 29th! Call Giga-Bites Cafe to register. Started in 2012, the Atlanta 40k Series has been the premier rogue trader tournament series in Georgia. 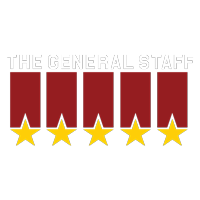 For 5 years, the General Staff has delivered their unique brand of 40k, for the fun and competitive challenge of anyone willing to test their mettle. The Series takes place at GigaBites Cafe, and usually kicks off at 9 am. The Series is partnered with the Independent Tournament Circuit and Frontline Gaming. All Series events submit their scores to the ITC. All of the directions to assemble your army for the Atlanta 40k Series can be found here. The Rules of Engagement, The General Staff's FAQ, will be in effect at the Atlanta 40k Series. Click here to read about what changes and clarifications have been made. The missions played at the 2nd round of the Atlanta 40k Series of the 2018 can be found here. The missions played at the 1st round of the Atlanta 40k Series of the 2018 can be found here. The appearance rubric found here will be used for paint judging and potential entry into the Armies on Parade competition.